In July 19, 2012, the DVB turned twenty. There have been many ups and downs over those two decades, but we are proud to say that we have not only survived but also managed to become Burma’s most popular privately-run satellite TV station. We think that is worth a book to let people know how it all began, and how we grew. And we hope that people in other parts of the world would also be able to learn from our success as well as our mistakes. But producing this book cannot be done without your participation. The DVB has always been the voice of the people of Burma, and we would also like to engage your help in celebrating our twentieth anniversary. We intend to post chapters of the book on this website, gradually to give you time to read them and contemplate what we have written. Then we would like to invite you to submit your own input. Is there anything that you think is weak, misleading or outright wrong in our account of the DVB’s history? Any events which need to be included, any important individual that we have overlooked but who should be mentioned? We are also looking for photographs of the DVB’s various activities that you may have in your possession and would want to share with us. We cannot offer you any payment for this, but, if you wish, we will certainly include your name in the list of contributors to our book. You can also remain anonymous, if that is what you want. Please send us your contributions, criticisms and other comments — and whatever pictures you may have — using the form below. Bertil Lintner compiled and edited this book. It was not the first time a group of Burmese set up a radio station to provide an alternative to the official, state-run broadcasting service. But it was clear that the potential was different when the Democratic Voice of Burma (DVB) first went on air on July 19,1992. Previously, various rebel groups had run their own clandestine radio stations. The Communist Party of Burma inaugurated its People’s Voice of Burma in March 1971, first transmitting from across the border in China and later via a new facility in the Wa Hills in northeastern Shan State. In the 1970s, non-communist anti-government forces allied with former prime minister U Nu maintained a radio station in the jungle somewhere along the Thai border in the east, but its broadcasts were irregular and the reception extremely poor. Karen rebels also had a transmitter for a short while in the early 1980s, but it fell silent when government forces began attacking their bases on the Thai border in 1983. From the very beginning, the DVB was headquartered in safety in far-away Norway, and it was under the direct control of no particular armed resistance group. During the first years of its existence, however, the DVB was not free from interference from ethnic rebel armies based on the Thai border, especially the Karen National Union (KNU) whose headquarters housed the DVB’s first studio inside Burma. When it first started, the DVB also represented the National Coalition Government of the Union of Burma (NCGUB), which was made up of MPs who had been elected in the May 1990 general election, but who were then prevented from forming a new government and forced into exile. But all that changed as the DVB gained experience and became more professional. In 2002, DVB broadcasts ceased mention of the station’s affiliation with the NCGUB, and, in 2006, officially declared its independence. The DVB became a properly registered Norwegian foundation, based in Oslo and subject to Norwegian laws. The DVB thus gained full editorial and administrative independence and its board members served in an individual capacity, not as representatives of any political group or faction. By then, the DVB had also set up its own satellite TV station. It had gone into operation in 2005, and become an instant success wherever it could be received inside Burma. The DVB may be unique in many ways, but the Burmese broadcasters in Oslo did not, historically speaking, start from scratch when they launched it in 1992. Burma has actually a long and proud tradition of a free media. The country’s first newspaper, the English-language Maulmain Chronicle, appeared in 1836 in the city of Moulmein in then British-held Tenasserim. It was followed in 1853 by the Rangoon Chronicle. The first Burmese-language newspaper, Yadana-bon Nay-pyi-daw (with the heading “Mandalay Gazette” in English on the front page) was established in Mandalay in independent Burma in 1874 as the official organ of the kingdom. The year before the launch of the paper, King Mindon enacted a law consisting of 17 articles to guarantee freedom of the press stating that the media is for “the benefit of the citizens to hear general news from Europe, India, China, and Siam for enriching the thoughts and improving their trade and communication.” This act is believed to be Southeast Asia’s first indigenous press freedom law. During the British colonial period, which lasted until independence in 1948, Burma had dozens of newspapers in Burmese, English, Chinese, and several Indian languages. Periodicals were also printed in Burma’s minority languages. Among the most outspoken newspapers—which lent support to the Burmese nationalist movement—were the Burmese language Thuriya (the Sun) and Myanma Alin (the New Light of Burma). The latter was founded in 1914 and for years it was managed by U Tin, who became a minister in independent Burma’s first government, led by U Nu, in 1948. Burma’s rapid media development in the 19th and 20th centuries can best be explained against the background of its rich intellectual traditions. The country has always had a high literacy rate and education has been a source of national pride since pre-colonial days. At the age of seven or eight, every Burmese boy was sent to the local monastery to learn to read, and write, and to memorise Buddhist chants and Pali formulas used in pagoda worship. Education was less universal for girls but, even so, the census for Burma in 1872 stated that “female education was a fact in Burma before Oxford was founded.” This long and strong tradition of widespread literacy was further enhanced with the introduction of British-style education during the colonial era. In early 2005, DVB decided to take a bold step, which no non-governmental media organisation in Burma, and perhaps in the world, had ever done before: to launch its own satellite television station. Many were sceptical and thought the idea was too ambitious and some even said it was unrealistic. Short-wave radio was one thing, but television? But Burmese journalists in exile in Norway and Thailand were determined to make it work. A young couple, Tin Ko Ko and Sandar Lin, who had some experience of working for Myawady Television, a military-run television network based in Rangoon whose entertainment programmes were quite popular, took part and shared their experiences with some of the Burmese who previously had worked only with DVB radio. DVB TV would probably never have been as successful as it has become without the hard work that Tin Ko Ko and Sandar Lin put in during its first year of operation. Additional training was provided by professional cameramen and news anchors from AsiaWorks Television, a leading independent media company based in Bangkok. In May 2005, the trainees were ready—and the DVB began telecasting from London via satellite. The timing was perfect. DVB TV was launched when Burmese were beginning to have the possibility of having satellite dishes to receive international TV stations. At first, people could buy satellite dishes but they had to be registered through a cumbersome process. But despite the rigidity of the laws surrounding the possession of satellite dishes, sales exploded in the early 2000s. Officially, 200,000 people registered their equipment during the first years of satellite TV access in the country, while many more dishes were acquired on the black market. The number of people watching international stations was even higher as many tea- and coffee shop owners had satellite TV services installed in their establishments to attract customers. It became an instant success, which ushered in a new era in the Burmese media landscape. DVB TV was popular from the very beginning, but the main breakthrough came when the monks’ movement swept across Burma in September 2007. The DVB’s clandestine network of reporters and stringers covered the events from the very beginning, deploying both old and new media to inform the people in Burma about the uprising. DVB reporters shot footage on hidden digital cameras and sent it over the border to the DVB office in Thailand, or over the Internet to headquarters in Norway. Photographs and video footage shot by DVB reporters and even ordinary citizens on mobile phones were also uploaded onto the Web and sent to Oslo headquarters, which, in turn, edited the material into radio and television reports to be broadcast back into Burma. While DVB’s shortwave radio and satellite TV broadcasts reached a significant portion of the population in Burma, it was the first time the Internet—and blogs—played a crucial role in broad and timely reporting of a major event inside the country. Bloggers, who were in touch with the DVB, found innovative ways to circumvent government restrictions and to send out updates throughout the protests. Meanwhile, the DVB made its coverage available on the Web, where it was picked up by the BBC, CNN, Deutsche Welle, Al Jazeera and other international news networks. Even when Burma’s only two Internet service providers were disabled between September 29 and October 4, 2007 at the height of the protests, DVB reporters on the ground were able to send their coverage to Oslo via their own satellite hook-up. Like all other radio (and TV) stations in the world, the DVB has all along also offered its listeners and viewers not only news, scoops, political debates and analyses but also songs, music and other kinds of entertainment. And like everything else with the DVB, its entertainment programmes started on a very modest scale and, like its other broadcasts in the beginning, the tune was very political. 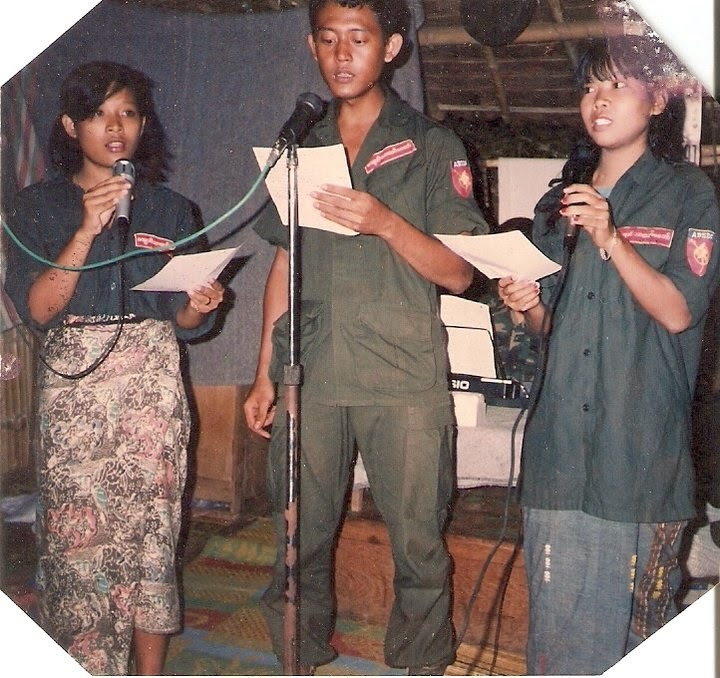 Students in rebel camps along the eastern border recorded their songs on tapes which were mailed to Norway from post offices in Thailand. Other songs were recorded inside Burma or in exile, such as Ma Ma Aye’s very popular number about a man who had left his home village for his beliefs in justice. Listeners could draw parallels with the students who had gone to the border to take up arms against Burma’s then military government. Other popular songs were old patriotic jingles from World War II and the independence movement, while the famous Kachin singer Dennis Mun Awng’s songs about more contemporary subjects were also well-liked, especially among the young. Born in Kachin State in 1960, Mun Awng first became popular in the 1980s. He joined the August 1988 uprising and was among those thousands of dissidents who fled to the Thai-Burmese border after the crackdown on September 18 and the formation of the State Law and Order Restoration Council, SLORC. Five years later, in 1993, he arrived in Norway to begin working for the DVB. With singers like Mun Awng on the air, the popularity of the DVB’s entertainment programmes increased and listeners also began sending in their requests for songs they wanted to hear. Another singer and also actress, May Sweet, was also popular but her melodies were considerably less political. She left Burma for the United States in the late 1990s, married a Burmese-American from New York and settled in Delaware. But she continues to perform for Burmese expatriate audiences around the world. The DVB’s entertainment editor, Thida Thin Myat Thu, acted as Master of Ceremonies when May Sweet gave a concert in London ten years ago. Programmes playing requested songs, however, served another purpose than broadcasting popular songs just for the sake of entertainment. Following the 1988 uprising and subsequent upheavals, many families were separated and people who had been friends in the cities and towns lost touch with each other. Parents requested songs for their children, and children who had made it to third countries as refugees requested songs for their mothers and fathers to let them know where they were. Boyfriends requested songs for lost girlfriends and vice versa. Many people were reconnected in this way, and the DVB also helped them re-establish contact with each other. He sang Ahmay Ta Khu Thar Ta Khu (A Dedicated Song to Mom) and Mone Mone Mae Mae (Are You Leaving Me Alone? ), songs from the 1970s, on stage in the United States against a backdrop of National League for Democracy (NLD) and US national flags, a Buddhist banner - and a portrait of Aung San Suu Kyi. Lashio Thein Aung himself, sporting an embroidered black shirt and a cowboy hat, drew thunderous applause from his enthusiastic audience. For a younger audience, the DVB became a platform for more modern singing styles such as rap and hip-hop. Young Burmese were quick to embrace rap and hip-hop - perhaps because the style was quite akin to traditional Burmese thangyat. Also sung in a staccato manner and often with a satirical message, thangyat has been performed for centuries during thingyan, or Buddhist New Year, which falls in mid-April. After the 1988 uprising especially, thangyat became a way in which many Burmese could express their frustrations with political hardships as well as economic difficulties, often in a humorous manner. Perhaps not surprisingly, the authorities banned thangyat when thingyan was celebrated, although in April 2012 it was permitted once again. Among the thangyat performers in Mandalay in 2012 were the popular Moustache Brothers, a trio of local comedians - Pa Pa Lay, U Lu Zaw, and Lu Maw – distinguished by their impressive whiskers. “Thangyat performances, a traditional music that accompanies New Year’s Thingyan Water Festival, is now legal in Burma. The historic art is a cornerstone in the country’s New Year celebrations, where singers dance and engage in “call and response” anthems, while joking about the events of the past year. However, Thangyat performances had been officially suppressed for three decades by several laws that were aimed at preventing citizens from assembling and chanting slogans. Mandalay-based writer Sue Hngat says Thingyan and Thangyat are inseparable: “It’s been over 30 years – Thingyan and Thangyat are the two things that cannot be separated because Thingyan is for the people and it should be free for all and should not be monopolised by any individual or a group. This also applies to Thangyat to an extent,” To celebrate its return, Mandalay-based comedian Pa Pa Lay of the Moustache Brothers said the group will perform Thangyat songs on a float during the parades in Mandalay. According to the moustached comedian, the troupe will perform satirical numbers that address the country’s education, health, economy and judicial sectors. “The people of Mandalay have been waiting to hear Thangyat again so Pa Pa Lay is organising the performance together with his other comedian friends,” said Lu Maw, Pa Pa Lay’s brother and fellow moustached brother, Mandalay based writers including Soe Aung, Khin Aung Wint and San Win Shein and some poets are also organising their own Thangyat performances during the festival." Among the younger hip-hop singers and rappers, MFG, or the Myanmar Future Generation, was more overtly political. They sang about what it’s like to be in prison, why the people should stay united and how younger people can learn from older activists. Some hip-hop artists like Anegga Tweezy and Zayar Thaw, were already popular when the DVB began broadcasting their performances, but the DVB nevertheless helped promote them and gave them an outlet at a time when the government-controlled media refused to play their songs. This is the chapter where we need your input the most. Only you can tell us what you think has been learned from our twenty years of operation, and what you believe our future should be. We have made a list of mistakes and successes which we think have characterised the development of the DVB since its inception in 1992. We hope this will be a good start, and encourage you to send us your thoughts and comments. We would appreciate it if you could elaborate on the points below. 1. DVB started with a loose structure and poor equipment, and the first broadcasters lacked journalistic skills. 2. Also in the beginning, we did not get much feedback from listeners, and, on our part, we did not conduct proper listener surveys and do other research that was needed to improve the quality of our broadcasts. 3. We lacked training in professional journalism. 4. In the early years, we failed to recruit professional media persons to work with us. 5. In the beginning, there were also too many stakeholders and political factions that tried to influence, and even control, our broadcasts. 6. Thus, it was several years before we could become independent. There was also too much secrecy surrounding our work, and almost no transparency in our operations. 7. The signal was very weak. 8. It has been difficult to work effectively because we have had operations in Burma as well as in Thailand and Norway. It has not always been easy to coordinate the efforts of our various operational sites. 9. The funding was very uncertain in the beginning, and we are still almost totally dependent on international donors. 10. We have had no proper plan for generating income and becoming financially independent. 1. There has always been a strong commitment on the part of our employees and volunteers. Everyone has been ready to work under circumstances which often have been extremely difficult. 2. We have always been flexible and willing to adopt changes. 3. Our bureaucracy has been minimal compared to other, commercially-run media organisations. 4. Our operations have always been very cost effective. 5. A major asset has been the fact that we have different outlets: radio, TV and the web. 6. We have also been quick to acquire and use modern technology. 7. We have had tremendous support from loyal listeners and viewers inside the country. This has made it easy for our extensive network of reporters inside the country to gather news and other information. 8. In fact, listeners have felt that they “own” the DVB; it’s “their” broadcasting station and “their” TV. 9. Unlike other broadcasting stations, the DVB has always been run exclusively by people of various nationalities from Burma. That has also given us a multi-ethnic profile that most other broadcasting stations lack. 10. As soon as we became independent of political factions, we were able to work together with international media organisations - for our mutual benefit. If asked, when leaving this world, what I would like to take with me, I would answer without hesitation: a radio and a book to read. That is the present day situation. In the past, apart from school textbooks, I didn't know what radio was, let alone read novels from the book shelves. Although I knew that radio was something important, I could not imagine what it looked like. There was only one radio in the village. Two years later, we ended up in Bago as war refugees. I heard the sound of a radio a house away. Although I tried to hear it from the window, it wasn’t very clear. “That is the Voice of Burma,” Ko Ko Gyi told me. The house I lived in had been confiscated by an army artillery battalion and we had to study in a bamboo lean-to constructed at the edge of the school compound. There were clashes about 15 miles away from Bago. The voice of the army still existed and the main speaker was a Major Ba Ko, I was told by adult radio listeners. When I was in eighth grade at school, my friend Ba Myint, the son of a wealthy man made rich by the army, took me to his house, where there was a radio. It was reporting on a divisional football match and I heard noisy shouts and laughter. Many people who came to listen also laughed. When Sagaing goalkeeper Boe Thar Bay caught shots by Shan State’s Vah Doom the listeners clapped and I applauded with them. Then Ba Myint said that it is good only when listening to songs and I did not agree. In my eye, I only saw beautiful radio and in my ear, I only heard Vaha Doo and Boe Thar Bay. So my first experience of listening to the radio was happy and amusing. In 1953, I was admitted to Rangoon University with the support of the Muslim Central Fund Trust and stayed in Thaton hostel. I regularly listened to the radio at Thahaya and in reading rooms and heard programmes from the Burma Broadcasting Service, BBS (or myanma athan, the Voice of Burma in Burmese). When the radio was switched off at 8 pm I went with friends to listen in at a tea shop. Foreign broadcasts could be heard frequently at Ta-Ka-Tha building, Although now a keen radio listener, I never once dreamed that I would one day be a broadcaster. 0n 17 October 1959, I got a position at BBS as an assistant technician for recording and broadcasting. I wasn’t on the programming staff, so I didn’t work at the studio but at a transmission station using an emergency studio. You could call it a personal programme of General Ne Win's interim government’s psychological warfare department, using the equipment of the Voice of Burma. Although the BBS’s engineering department appointed us, I was not very pleased with the fact that our salary was paid by the psychological department. The DVB was founded by four student activists (three men and a woman) in their early twenties who had never worked in a radio station before. Their studio was a tiny room in a Norwegian NGO office. On a shoestring budget, they had to start broadcasting with only two cassette recorders and a microphone. The DVB has a unique history and, in the beginning, each day was a struggle. There was no time for apprenticeship until I joined them in 1996 at the invitation of the then director Daw Khin Pyone. There were teething problems and tantrums. Some of the staffers who had no interest in the radio business found themselves in a situation that they had not intended. During this crucial period, the present DVB director was able to attend a journalism course in the Welsh city of Cardiff. Since then it, has become almost customary for the DVB to send its newsroom staff to the Cardiff School of Journalism. This broke new ground and set the DVB apart from the programs offered by the major international broadcasting stations, where scripting was done by English speaking central staff who were typically less familiar with the local conditions in the countries to which they were broadcasting. By early 1997, the DVB was able to set up its own five-room office with a soundproofed studio in the basement of The Triangle Hotel in Oslo. We worked from dawn to dusk, earning only a paltry sum. Since it was like a big family, we also had a fair share of family quarrels. But we all were happy. I found myself doing a job that I really enjoyed while my dependable wife took care of our home in London. She was my rock. Had it not been for her my sojourn in Oslo would have been out of the question. I was in Oslo for two years and worked from London as a consultant for a further four years. One of the most important aspects of the DVB’s development from an amateur to professional level was the transformation of the routine news bulletin. While starting subscribing to Reuters and AFP news agencies, the DVB was able to develop its own house style during this phase. Most of the DVB journalists had started as “stringers"”who faxed the Oslo newsroom their reports on the events in the area they covered. Their material was written up for the news readers to deliver but their voices were never heard on the air. In fact, the DVB's daily 25 minute broadcast was constructed around news output, with about a half of its daily transmission time taken up with news, news analysis, and commentaries. Although the DVB has always recognized the importance of the regular announcers in providing a 'spine' to the daily program, some of the DVB broadcasters have become all-rounders because of a shortage of skilled manpower. Thus, a DVB broadcaster could be an editor, a producer, a newsreader, a presenter and a reporter all rolled into one. Soon, the station began broadcasting in some ethnic languages. The DVB also functioned as a surrogate free radio, giving dissident organizations outlets for their views which unavailable in any other forum. In the early days, the DVB programs were occasionally jammed by the SLORC military regime. Later the military regime seemed to have put more emphasis upon its own broadcasting business than upon jamming the broadcasts of others, having realized that jamming was expensive, rarely effective and merely made people want to listen to what was so important as to merit being censored in this way. During this period a network of freelancers, stringers and reporters was established, along with the DVB regional bureaus in India and Thailand. It was found that the DVB had brought new challenges and new opportunities to many young activists. They now knew how to place greater emphasis on the professional journalistic values of factual and impartial reporting and on separating news from commentary and advocacy. The DVB website was also created during this period and one young woman was sent to London on a DVB scholarship to study computer science for a year. One of the DVB’s most controversial - and celebrated - documentaries was “Burma’s Nuclear Ambition”. It created a sensation when it was aired in June 2010 by television news network al-Jazeera. A US congressman, Jim Webb, had to postpone his planned visit to Burma, questions were raised in Washington, and wires services all over the world did reports based on the DVB’s investigations. In the end, the controversy prompted even the Burmese government to announce that it has abandoned its nuclear programme, and stopped buying military-related equipment from North Korea, as shown in these two reports from 2012. However, the Reuters dispatch from Singapore says that some reports had suggested that Burma had obtained nuclear technology from North Korea; the DVB never made that claim in the documentary. The DVB showed how the Burmese military had sent officers for training in nuclear-related subjects in Russia, and said that parts of their missile programme and conventional weapons came from North Korea. SINGAPORE (Reuters) 2.06.12 - Myanmar has abandoned research on a nuclear program that never progressed very far, and has stepped back from close military and political ties with North Korea, the Southeast Asian country's defense minister said on Saturday.News reports two years ago indicated Myanmar obtained technology for enriching uranium from North Korea along with parts for a nuclear weapons program. The reports were based on interviews with an army major who was involved in the program and defected with files he said documented the project. "We have already said very clearly it was not for defense, it was not for weapons, it was just research in the past," the defense minister, Lieutenant General Hla Min, said at the Shangri-La Dialogue, an annual security forum in Singapore attended by senior regional civilian and military leaders. By CHOE SANG-HUN. AP. 15.06.12 - South Korea has received assurances from Myanmar that it will no longer buy weapons from North Korea, an aide to President Lee Myung-bak said Tuesday. President Thein Sein of Myanmar acknowledged that his country had bought conventional weapons from the North over the past 20 years but vowed in a meeting with Mr. Lee in the Burmese capital on Monday to end the practice, said the aide, Kim Tae-hyo. Mr. Thein Sein also indicated Tuesday that Myanmar had not pursued the development of nuclear arms and vowed to honor a United Nations Security Council resolution that bans countries from activities that could assist North Korea’s missile programs, Mr. Kim said. Over the years, many DVB journalists have been arrested by the authorities simply for reporting news to the Burmese public and the outside world. We cannot disclose all of them because several were working undercover for the DVB, but we would like to honour five of our journalists whose cases were taken up by international human rights and press freedom advocacy groups and, therefore, their association with the DVB became known. Hla Hla Win was first arrested in September 2009, close to the anniversary of the 2007 monk-led uprising, and sentenced to seven years imprisonment. She had been detained under the Import/Export Act for using an unregistered motorbike. The arrest took place as she was returning from a DVB reporting assignment in Pakokku township, Magwe division, where she had conducted interviews with Buddhist monks in a local monastery. Her assistant, Myint Naing, was also arrested, and eventually given a 26-year sentence. During the first weeks of her seven year sentence, she was interrogated and eventually admitted to being a DVB reporter. On December 20, 2009 her jail term was extended by 20 years for violating the Electronics Act, which prohibits downloading or uploading data from the internet that is considered damaging to the security of the military regime. This is a tactic often used by the regime to imprison video reporters. She was handed a further 20 years and offered no legal representative. Hla Hla Win first joined the DVB as an undercover reporter in December 2008. She played an active role in covering issues considered sensitive to the government, including the local reaction to the controversial trial in 2009 of Daw Aung San Suu Kyi. In 2010, Hla Hla Win received the Kenji Nagai Memorial Award, along with fellow DVB reporter Win Maw, an honour bestowed on Burmese journalists in memory of the Japanese photojournalist shot and killed by government troops while covering the September 2007 monk-led uprising. She was also a volunteer teacher working in monastic education centres, and a leading organiser of community movements along with her colleagues. She was also an active member of the NLD (Youth) from Thanhyin township in Rangoon. Sentenced: November 11, 2008/March 5, 2009; 17 years. Was kept in Kyaukphyu prison, Arakan State. In March 2009, award-winning journalist Win Maw was sentenced to 10 years in jail. He was already 18 months into a seven-year sentence on charges of breaching the Immigration Act when the additional decade was added. During a raid on his house in early 2009 whilst he was detained, police had found disk full of data destined for DVB. They then begun an investigation into his activities as a VJ. His family said that he was beaten and tortured during the early stages of his detention, with interrogators reportedly “waterboarding” him and breaking his nose. The authorities accused him of being the “mastermind” behind the DVB’s in-country news coverage of the September 2007 monk-led uprising. His jail term was subsequently extended under the Electronics Act, which allows for harsh prison sentences for using electronic media to send information outside the country without government approval. A prominent singer and songwriter, Win Maw began working for the DVB in 2003, one year after he was released from his first spell in prison for composing pro-democracy songs. He has also composed music for the DVB, as well as passing on photos and videos from opposition groups such as the NLD and 88 Generation Students. He took part in many of their campaigns and activities as an organizer on top of his role as a DVB reporter. Win Maw, who was held in Kyaukphyu prison in Burma’s western Arakan state, received the Imprisoned Artist Prize in 2008, the Kenji Nagai Memorial Award in 2010 along with another arrested DVB reporter Hla Hla Win, and the prestigious Freedom to Create award for jailed artists in 2011. Ngwe Soe Lin was arrested by military intelligence on June 26, 2009 along with a friend in an internet café in Rangoon. After spending several weeks at the Aungthabyay interrogation centre, he was sent to Insein prison. Seven months later, on January 27, 2010, a special military court attached to Insein prison sentenced him to 13 years in prison on charges related to the Electronics and Immigration Acts. The following month, on February 18, he was sent to Lashio prison in northern Shan state. Ngwe Soe Lin joined the DVB in early 2008 and reported from around the country. He played a vital role in recording the lives of children left orphaned by cyclone Nargis in 2008. His video records were turned into a Channel 4 documentary, “Orphans of Burma’s Cyclone”, for which he received the prestigious Rory Peck Award 2009, honouring cameramen working in dangerous environments. He was awarded this whilst in detention. Sentenced: December 21, 2010; 8 years; then 10 more years on November 7, 2011. In April 2010, a series of grenade blasts rocked Rangoon during tingyan, the traditional New Year water festival. Sithu Zeya photographed images of the aftermath from a location near the banks of Kandawgyi Lake in Rangoon. The 21-year-old was arrested shortly after, and interrogated for five days. During this period he was tortured and denied food for two days, and in December 2010 sentenced to eight years imprisonment under the Immigration Act and Unlawful Association Act. The verdict on Sithu Zeya’s case was based on informal confessions resulting from the torture he suffered during interrogation. His charges stem from the Burmese government’s press laws, which targeted media workers judged to have passed on material to exiled news outlets. Sithu Zeya was forced to reveal under torture that his father, U Zeya, also served as an undercover DVB reporter. U Zeya is now serving a 13-year sentence. Sithu Zeya was sentenced to an additional ten years in prison on November 7, 2011, a few days after an amnesty that saw 230 political prisoners released. However, he was released ion January 13, 2012. U Zeya was arrested at his home in Rangoon on April 16, 2010, shortly after his son Sithu Zeya had been arrested for taking photos of the water festival bombings in Rangoon. Sithu had reportedly confessed to his father being a DVB reporter after days of torture. The father had led a team of DVB VJs inside Burma. His lawyer said after the trial that the only witnesses in the closed prison court were police. The trial ended in February 2011 and he was sentenced to 13 years in prison under the Immigration Act, Unlawful Associations Act, and Electronics Act. First arrested in 1976 for participating in a students’ strike, U Zeya has a long history of political activism. Under the pen name Thargyi Maung Zeya, he has also written poems and articles in a number of Burmese magazines and journals. Media House Democratic Voice of Burma has her last week in Oslo. Since 1992, they sent uncensored news to the country of Norway . Now they travel home . Why has Norway and Burma so closely linked ? Why Norway was the first country outside Asia as Aung San Suu Kyi visited after she was released ? The main reason is of course the Nobel Peace Prize in 1991. A close second is the radio station Democratic Voice of Burma. The radio station has sent uncensored news to Burma since 1992 , and has long since become a media of television , radio and internet. For 21 years they produced broadcasts from Oslo. They have helped to create a unique interest in Burma in Norway . That they have now opened an office in Yangon in Burma is an indicator that the reforms have allowed for media and independent organizations in Burma. It is too early to determine whether reforms in Burma actually ends in a real democracy and freedom of expression ensures that the media's right to criticize without fear of reprisal . But the last three years has made the DVB took a chance . The main office is now in Thailand, but the media house has an office in Burma, which is growing . The dream has always been to return home and become a media in Burma for his people . Today this dream close to fruition. Before 1991, Norway and Burma little in common . Norway was the first Secretary General of the UN. Burma had the third. A historical curiosity is that the Norwegian-registered vessel Hai Lee brought Aung San from Rangoon to China 1940. The journey finally ended in Japan, which is considered the starting point of the Burmese struggle for independence from the British colonists . The relationship between Norway and Burma took a new course when Rafto Prize in 1990 was awarded the liberation hero's daughter, Aung San Suu Kyi , who after demonstrations in 1988 quickly became the foremost symbol of democracy and human rights in Burma. Nobel Committee went on to award her the Nobel Peace Prize the following year, after intense lobbying from Burma Committee and Rafostiftelsen , with Vaclav Havel as a good ally. In the course of six years, the Norwegian authorities , in close cooperation with Burma Committee and Worldview got a Burmese radio station on the legs . The importance of this work can hardly be overestimated . The history of radio station Democratic Voice of Burma is worth a few lines . It is worth a book. The radio station was through an intense collaboration between Burma Committee Hallvard Kare Kuloy , Worldview International's Arne Fjørtoft and Ministry of Foreign Affairs Jan Egeland . Broadcast Manager at NRK, Einar Forde, was asked to spare a few frequencies to the Burmese news channel to send Burmese news via shortwave from Kvitsøy outside Stavanger. The case had up at government level for a clarification. Burmese students were in a short time course in journalism in the border area between Thailand and Burma. Four young Burmese were flown to Oslo to establish the channel, and came in contact with one of the very few Burmese living in Norway . The start was partly financed by loans from the owner of Texburger , where Maung Maung Myint worked part-time , and student loans from the same Burmese dentistry student. The budget was 21 000. 19th July 1992 DVB went on air for the first time. Recorded tapes were sent by mail to Kvitsøy outside Stavanger, and arrived just in time for the first radio broadcast. The entire process , from idea to broadcast , it took more than half a year, which must be unique in Norwegian administrative history. To run a news channel depending on the postal service in Norway is of course a challenge. The news may at times be read before they happened , and sometimes went wrong . In 1993, the regime launched a constitution preparatory meeting , but immediately chose to delay the process indefinitely . DVB had already recorded the novelty of Oslo and the program was headed in the postal service . What do you do when the news turned out to vote ? Reporters jumped on the first flight to Stavanger , overtook postal service , and managed to correct the pre-recorded element . A local technician hint about how the Burmese reporters could turn on the phones , and send transmissions via phone . Creative engineering meant that it is now able to produce broadcasts after the news happened , not before. There was a small revolution , several years before verdensvevens age. There have been many dark years since 1992. To listen to DVB in Burma was until recently strictly prohibited and punishable by imprisonment . Journalists in Burma have risked everything to disseminate news about what actually happened in one of the world's most brutal dictatorships . Under Safranrevolusjonene in 2007 , which was led by Burmese monks were journalists from DVB documenting how the regime put down on peaceful demonstrators , with lives at stake . There are only six years ago. No one should believe that the struggle for democracy has ended. The road to democracy has just begun . The reforms are the result of DVB and other brave frihetselskeres struggle for democracy. DVB need all the support they can get to continue to be an alternative to propaganda . It is alive and well . To create a democratic culture, and real freedom of the press , take time in a country that is used to let the weapons do the talking . The new media law limits the scope for cross- publish content on television, radio and online . Media freedom for newspapers is of course very important, but so is the radio and television that reaches out to people across the country. Democratic Voice of Burma has never been more important and never been vulnerable. Thus continued support has never been more critical. At the Burmese journalists now heading to Burma gives reason for hope , while it is a little sad to lose a key vote in Burmese Norwegian public. DVB is a product of Norwegian support for the Nobel Peace Prize. Meanwhile, much of the Norwegian Burma involvement resulting from DVB . So thank you for 21 great years in Norway and good trip to Burma. It is now the beginning . "From its modest beginnings in 1992, the radio station Democratic Voice of Burma has continously defied the generals. Just as Norwegians gathered in suspence around their radios to listen to "The Voice from London" during World War II, the Burmese also have their voice of resistance: The Voice from Oslo." Says Norwegian PEN president Anders Heger: "Democratic Voice of Burma demonstrates the power of the free word during a country´s hours of destiny. Norway has every reason to be honored to house such an important and brave institution." PUBLISHED ON WEDNESDAY 5 DECEMBER 2007. UPDATED ON THURSDAY 6 DECEMBER 2007. Eritrean journalist Seyoum Tsehaye has been chosen as “Journalist of the Year 2007” by Reporters Without Borders - Fondation de France. The other winners are : the Journalist freedom observatory (Iraq), Democratic Voice of Burma, the Egyptian blogger Kareem Amer, Chinese husband-and-wife human rights activists Hu Jia and Zeng Jinyan. Eritrean journalist Seyoum Tsehaye has been chosen as “Journalist of the Year 2007” by Reporters Without Borders - Fondation de France. The panel of judges sought to highlight not only the case of this brave journalist held in Eritrea’s appalling jails since September 2001 but also the catastrophic state of press freedom in this small Horn of Africa country. At least four journalists have died in prison in Eritrea over the last few years. The blame lies chiefly at the door of Issaias Afeworki, the highly authoritarian and obdurate president of the country since its independence in 1993. Demonstrations by Buddhist monks and the crackdown that followed put Burma at the top of the news agenda at the end of September. Reporters Without Borders and the Fondation de France decided to award the prize in the Media category to the Democratic Voice of Burma TV and radio, one of the most reliable sources of news during the crisis in Burma. The Arab world features in two of the awards this year. ““The Journalistic Freedom Observatory in Iraq, was rewarded with the prize of Press Freedom Defender for its vital role in exposing violence and murder against journalists. And the young Egyptian blogger Kareem Amer is the laureate in the Cyber-dissident category. The 23-year-old was sentenced to four years in jail for criticism posted on his blog of President Hosni Mubarak and of the Islamist grip on the country’s universities. Finally, with just a few months to go before the opening of the Beijing Olympics, Reporters Without Borders has awarded a special "China" prize to husband-and-wife human rights team Hu Jia and Zeng Jinyan, who are under house arrest. Holed up at home the two activists nevertheless continue to do their best to keep the entire world up to date with damaging effects on the Chinese people of the preparations for the Olympic Games. In rewarding a journalist, a media, a press freedom defender and a cyber-dissident, Reporters Without Borders and the Fondation de France alert public opinion to the full extent of violations of the right to inform the public and to be informed and the importance of commitment to press freedom. Each prize is worth 2,500 Euros. Since it was founded, the Reporters Without Borders - Fondation de France prize has been awarded to: Zlatko Dizdarevic (Bosnia-Herzegovina - 1992), Wang Juntao (China - 1993), André Sibomana (Rwanda - 1994), Christina Anyanwu (Nigeria - 1995), Isik Yurtçu (Turkey - 1996), Raúl Rivero (Cuba - 1997), Nizar Nayyouf (Syria - 1998), San San Nweh (Buma - 1999), Carmen Gurruchaga (Spain - 2000), Reza Alijani (Iran - 2001), Grigory Pasko (Russia - 2002), Ali Lmrabet (Morocco - 2003), Hafnaoui Ghoul (Algeria - 2004), Zhao Yan (China - 2005) and U Win Tin (Burma - 2006). Burmese musician and journalist Win Maw has just won a major prize, Freedom to Create which encourages artists who work to promote social justice. A concert to raise awareness of Win Maw’s imprisonment took place in the northern Thai city of Chiang Mai last weekend. Freedom to Create has a total prize fund of US$100,000 which is awarded to artists who further the cause of justice and the human spirit. In 2011, they recieved more that 2000 prize entries from over 145 countries around the world. PBS's "Wide Angle" aired "Eyes of the Storm" last week, a documentary on Cyclone Nargis and its aftermath. Like Anders Ostergaard's recent film "Burma VJ" on citizen reporters during the monk-led protests in 2007, which we wrote about in April, "Wide Angle" contrasts independent reports filmed at great risk with the junta's state media claims that aid was under control. Independent journalists like "Zorro" smuggled footage from makeshift villages through the exile media group Democratic Voice of Burma to London-based journalists Evan Williams and Siobhan Sinnerton. Some on the ground had no journalism experience. "How is this possibly going to result in documentary footage when we're having to show where the 'on' button is?" Sinnerton worried at the start of the project. But the results seen here, and in the journalists' own documentary for the U.K.'s Channel 4 "Dispatches" program, are powerful. The scariest moments and when I suffered the most, psychologically, is when I was questioning children or taking photos in the village or when I was asleep, and suddenly I'd hear the sound of a boat in the river. I'd wake up and become very frightened ... I worried the soldiers would call out my name, point a gun at my head, and arrest me. I thought to myself, what would I do? As an added reminder of the dangers, the program highlights the fate of three journalists on CPJ's 2008 imprisoned list. Zarganar (whose real name is Maung Thura), Eine Khine Oo and Kyaw Kyaw Thant are now serving prison terms for helping and reporting on relief work. A slideshow on the journalists and others imprisoned for working with cyclone victims is on the PBS Web site. CPJ's 2008 report on undercover reporters, "Burma's Firewall Fighters," is available with other Burma coverage on the CPJ Web site. On May 2 2008, at about 6pm local time, Burma was struck by the worst natural disaster in its history. Unleashing winds of up to 135mph and triggering flood waters that surged to 16ft, Cyclone Nargis tore across the Irrawaddy Delta in southern Burma and swept up through Rangoon, leaving roughly 140,000 dead and 2.4 million displaced or severely affected. Among the survivors were tens of thousands of children, orphaned or separated from their parents, who in the immediate aftermath were left to fend for themselves. A year later, some have been reunited with family members, some have been taken into orphanages and monasteries, and some have ended up in refugee camps on the Thai-Burma border. But many children are still eking out an existence on their own, faced with the daily ordeal of accessing food and drinking water, while living in makeshift huts constructed out of bamboo and tarpaulin that offer scant protection from the impending monsoons. Orphans of the Storm, a remarkable documentary that uses footage shot undercover by Burmese cameramen across the restricted delta region, tells the harrowing stories of these orphaned children and honours their extraordinary resilience in the long year since Nargis. The idea for the documentary originated with Evan Williams, a former south-east Asia correspondent for ABC (Australian Broadcasting Corporation), who approached Ed Braman, the commissioning editor of news and current affairs at Channel 4, shortly after the cyclone hit. In collaboration with Quicksilver Media, the production company behind the acclaimed Unreported World series, Williams, 45, was determined to document on film the unfolding situation in Burma. Even when foreign aid got through – Save the Children reports having reached more than 160,000 people with food, water, plastic sheeting and basic provisions within two weeks – it proved inadequate to meet the need. Human Rights Watch later noted that only just over half of those affected by the cyclone had received any form of international assistance after two months. Instead of deploying its 500,000-strong army on emergency relief, the Burmese government was seen to focus its resources on mounting a national referendum. Burma VJ: Reporting from a Closed Country is a 2008 Danish documentary film directed by Anders Østergaard. It follows the Saffron Revolution against the military regime in Burma. The "VJ" in the title stands for "video journalists." Some of it was filmed on hand-held cameras. The footage was smuggled out of the country, physically or over the Internet. Other parts of it were reconstructed, which caused controversy. The film won numerous awards, especially at European film festivals, e.g. it won the Golden Apricot at the 2009 Yerevan International Film Festival, Armenia, for Best Documentary Film. It won the World Cinema Documentary Film Editing Award at the Sundance Film Festival. Burma VJ was also nominated for an Academy Award for Best Documentary Feature. The film was released to one theater on 20 May 2009 and grossed $5,554 in the opening weekend. Its widest release was in three theaters. As of 1 May 2010, the total gross stands at $123,477. The DVD includes a message from Buddhist actor Richard Gere comparing the situation in Burma to that in Tibet. Jump up ^ Thomas, Kevin (29 May 2009). "'Burma VJ' vividly details monk uprising". Los Angeles Times. Retrieved 30 May 2009. Jump up ^ Bass, Charlie (28 May 2009). "FILM REVIEW: Burma VJ: Reporting From a Closed Country". The Indypendent. Retrieved 30 May 2009. Jump up ^ Marshall, Andrew (29 January 2009). "Burma VJ: Truth As Casualty". TIME magazine. Retrieved 6 August 2010. Jump up ^ San Francisco Film Society, "Golden Gate Award 2009 Winners". Retrieved 3 July 2009. Jump up ^ Variety, Mundell, Ian (1 December 2008). "'Burma VJ' wins Amsterdam prize". Variety. Retrieved 3 July 2009. Jump up ^ "Box Office Mojo". Retrieved 3 July 2009. Jump up ^ DVD Oscilloscope Pictures OSC-012, 2010. DVB closed it main office (from 19 July, 1992 to nov 20130 in Oslo Norway in Nov 2013. And move to Burma after negotiate with Burma regime in 2012. DVB also closed it short wave broadcast in 25 Oct, 2014. So now, DVB is run only TV and online, no more radio. (just added for background facts).